The line between Web apps and desktop applications grows ever blurrier. Chrome OS, for example, puts the browser front and center and makes it the core of an entire operating system. Also, in recent years simple smartphone apps have really come into their own, with millions of users and developers in two thriving ecosystems (iOS and Android). And now, it's the desktop's turn: Pokki is a free Windows application that tries to make Web apps as easy to use as desktop apps and as discoverable and fun to install as smartphone apps. Pokki's interface is beautiful, and somewhat similar to that of the Chrome Web Store. A desktop app store is not a new concept: Mac OS X has had one for a while, and so has Ubuntu Linux. Windows 8 has one as well, for Windows-8-style apps. But unlike the Windows 8 Store, Pokki works on existing versions of Windows. Introduced in 2011, Pokki is still young, but it feels polished and fun to use. There are clear categories for Featured, Popular, and New apps. Applications are also categorized by type, such as productivity apps, games, health related apps, and so on. Each app has reviews and ratings, so you can see at a glance what other users thought about it. Pokki's Apps menu shows a grid of installed apps, along with notifications. The Chromium sandbox means Pokki applications are sealed off from Windows. For example, applications can't make any changes to the local filesystem, so they can't save files to your hard drive. Another effect of this separation is that Pokki applications don't appear anywhere in the Start menu. Pokki app icons show up on the Windows taskbar, next to the start menu, but if you don't use a very high-resolution monitor, the Pokki icon bar can become wide very quickly. If that happens, you can remove the icons from the taskbar and use Pokki's centralized Apps menu, which shows a grid of icons for installed apps, not unlike an iOS or Android home screen. To make the resemblance even more complete, Pokki can also show notifications from your apps, so you can see who emailed you (and about what) without even opening Gmail, for example. Icons can also show little iOS-like notification counters, so you can instantly see how man unread emails or Google Reader items you have, for example. Pokki offers simple HTML5 games. Mixtape's Pokki app is a tiny, fuss-free player that gives you instant music from the cloud. The Pokki applications I've tried felt responsive and lightweight. 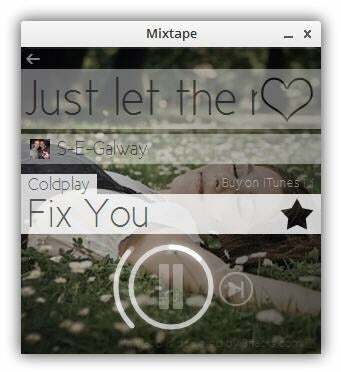 I was impressed by the Mixtape app, which popped up the compact window on my desktop that felt nothing like a webpage and allowed me to play music from Mixtape's servers with zero hassle, without even having to open an account. 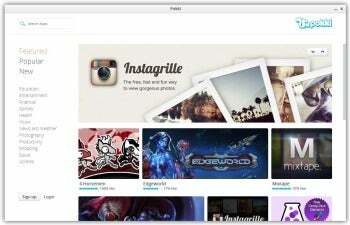 Pokki also offers an app for browsing the Facebook-owned Instagram photo service from your desktop, called Instagrille, which PCWorld reviewed separately. It is too early to say whether Pokki is going to be a smashing success that will forever change the landscape of Windows and Web applications, or just a nice idea that didn't quite work out. It has the makings of a success story, but for an app store to gain traction, it requires both users and developers in great quantities. Since Pokki is an independent player and is not backed up by a large industrial powerhouse such as Facebook, Google, or Microsoft, it still remains to be seen how much traction the system gets. I, for one, am keeping my fingers crossed.